[New for May 2013] It's the start of a new month and that means it's time to scope out the new blizzard. 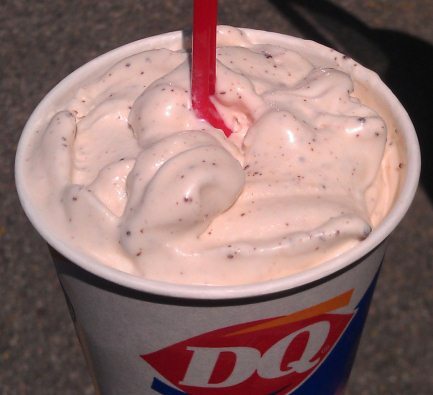 Dairy Queen is continuing the peanut butter streak from April's peanut butter filled blizzard. I've got (fairly) high hopes for this one. Now last month I was pretty unamused with the BotM. There was just way too much peanut butter flavoring for my liking. Did the server pop in too much pb? It's a distinct possibility, but I have to report on the blizzard the way it was served, and I'm going to do it again right now. See, my blizzard lacked the chunks to distract me from the base, but on the flip side I got a better read on the peanut butter flavoring. It was still strong, but hadn't crossed into overpowering. It very much reminds me of a reese's pb cup blizzard, but something strange happens in this form. Call it salty or call it tangy, but the liquid peanut butter hits me harder than it does on the reese blizzard. Maybe it's just the way it melts or lingers on the tastebuds, I just don't know. I would love someone to chime in and tell me I'm not crazy here. So my server got the pb ratio better, but they also obliterated most of the brownie bits with the blender. It's funny because when you hear them make it, your brain starts going "ummm, that blender has been on for awhile". Granted, I love how brownie bits look floating in soft serve, but I was looking for more whole brownies overall. Ofcourse, this problem would be solved by the addition of the chocolate chunks in a true blizzard of the month. At least the brownies that were left were pretty fresh. Am I done talking in circles? Sure, but I do mean well. At some point I'll probably head back and get a true blizzard of the month, but for now this faux sample will do. What you need to know is that the pb is still strong (if you get enough of it) but hopefully the chips should balance that out a bit, well, not that they helped a ton last month. It's really the brownies that our balancing things here. I mean, come on, it's not like a peanut butter brownie doesn't sound excellent. I just want more chocolate flavor here (though a chocolate base would be too much I think). Wait, if I can get a pb brownie blizzard.... then can I get a peanut butter oreo blizzard!! I told you to start ordering custom blizzards! For some reason, that second pictures looks a bit pink. I thought it was a strawberry peanut butter blizzard. (Which might be kind of cool. Like a frozen PB&J). And yes! Dairy Queen needs to have more consistency in its products. I like how they acted like they totally knew what you were talking about and threw something together even though they were clueless. "Do I speak Latin? Ellhay eahyay!" strawberry, peanut butter, and shortbread pieces maybe? my phone has never done well with blizzards, hopefully i will upgrade this summer. 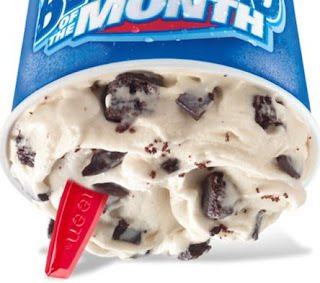 DQ getting a bit lazy, offering a peanut butter and chocolate blizzard a month after offering a peanut butter and chocolate blizzard. But I disagree about last months BotM, with the PB and the Pretzels. That thing was probably my favorite BotM since the Peanut Buster Parfait BotM. This looks much more enjoyable than the other chocolate and peanut butter pretzel blizzard.